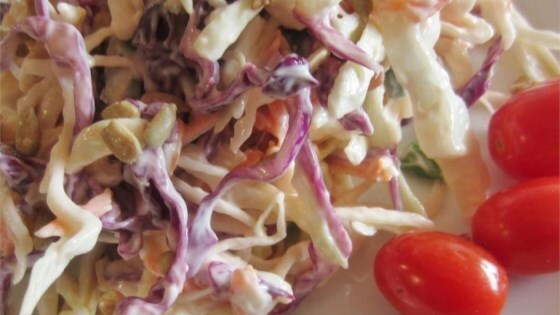 "I was making my old regular coleslaw one afternoon and found it too bland for company. I only had a few items on hand at the time to tweak the recipes, and pickles did not seem appropriate. So this is what I came up with. Very simple but very tasty. Since you use salted sunflower seeds, use salt sparingly." Combine coleslaw mix, celery, white and green onion, and sunflower kernels in a large salad bowl. Mix in mayonnaise; sprinkle salad generously with white vinegar, salt, and black pepper to desired consistency and flavor. Refrigerate overnight and adjust seasoning if desired. Delicious! Only thing I added was 1 tbsp of whole grain Dijon mustard and I used a fresh cabbage/carrot mixture instead of prepared. This will be my go-to slaw recipe! The slaw came out very, very good. I had a bag of ranch flavored sunflower seeds and needed to use some up. The added crunch makes this recipe. Thank you! Not much flavor. Not doing again.